With senior living focusing more on independence than ever before, the need for medical alert devices has soared. Recent monitoring systems advancements have allowed aid to many people suffering from medical hardships. But with all of the companies and personal emergency response systems on the market, where does one start looking for the perfect medical alarm device for them? For nearly every elderly need, there is a medical alert device that has features to help. From a fall detector medical alert to medication reminders, write down all of your individual needs and anything that could make your life easier. Next, figure out your budget, but remember that the more features you need, the more expensive the products – but if your goal is to live alone, no cost may be too high! We cover the most common elderly needs, what products may help you or a loved one face them, and how does life alert work. One of the most sought after features of a medical alert device is automatic fall detection. According to the CDC, over 2.5 million people seniors have medical emergencies because of a fall. Common injures are broken bones, traumatic brain injuries, or muscular damage. These medical alert button devices can automatically detect when the user has fallen and gives the user a small window of time to declare they are not harmed. If the user does not stop the alarm, emergency response will be called to the user’s residence. You live in a multi-level home and traverse stairs, or deal with the harsh conditions of winter, a fall detecting medical alert device is crucial. All it takes is one slip or fall to become incapacitated. Also, as age increases, muscular endurance and accuracy begins to fade, further heightening the need for a device with fall detection. For superior fall detection capabilities, we recommend Medical Guardian’s Home Guardian with the fall detection add on – note the 600 foot radius and pendants. If you or a loved one is still active, but needs protection on the go, a mobile medical alert system has features that ensure safety anywhere. These mobile GPS devices have a pendant you can wear, and with a touch of a button your location can be identified and help can be sent within minutes! With new technology, even the pendants have changed! Alert buttons are not the clunky models of the past, now they come in styles like a neck pendant or even a wrist watch design. If you are still active around the community, such as shopping and exercising, or travel around the country, having mobile protection allows the user to have help away from home. 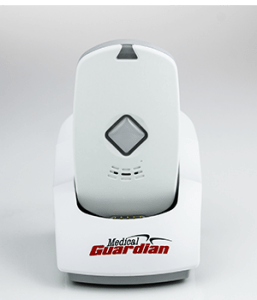 The Mobile Guardian from Medical Guardian allows users GPS location tracking and no activation fee. 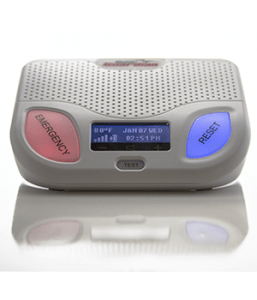 If you want to feel connected to medical or law enforcement personnel, then a traditional in-home medical alert system with emergency calling is for you. Few call 911 directly, but most call a monitoring center that attempts to help identify the problem and contact the appropriate authorities. The response time is usually within 30 to 60 seconds. You live alone or have an increased likelihood to need immediate care. Diabetics or people with epilepsy or Parkinson’s Disease are at a higher risk. All medical alert companies have built in features to allow emergency calling. Some use the home land line, while others have cellular medical alert capability. 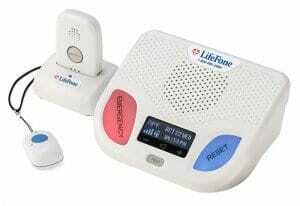 Here are some companies that offer emergency calling: LifeStation, Medical Guardian, Bay Alarm Medical, LifeFone. Over 75% of senior citizens take medication regularly in the United States. As the medication list can grow, sometimes it can be challenging remembering to take a certain pill. Some medical alert devices in addition to providing you with protection, will also visibly and audibly notify the user when it is time to take medication. If you take medication, using a device with medicine reminding can keep you from constantly searching through a medicine schedule, or missing timeframes. This LifeFone system has a great medicine reminding structure that can track up to 10 medications per reminder, and dosage levels. The premier medical alert device units on the market include many features that work well with each other. For example, having automatic fall detection is crucial to have when traveling or running errands outside the home. These models come with a premium cost but is cheaper and less clutter than getting multiple devices for different needs. You have multiple health or home security protection needs and are looking for a singular unit. 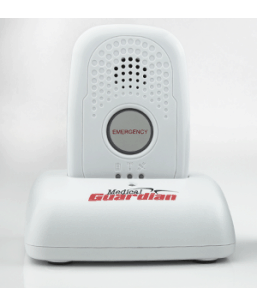 The Medical Guardian’s Premium Guardian is a top of the line model with many features. Interactive Risk Assessment tools are available on-line and provide valuable insight to products and services that may be beneficial to you in your particular situation or lifestyle. We recommend the following risk assessment tool from Medical Guardian for further insight. Whatever personal emergency response system you choose, we are sure you will enjoy the additional peace of mind that it brings.